"Girl Talk" is a route that can be found in the Bauhaus at Rifle. It may or may not be 8c+. Without wanting to make too much of a tempest in the teapot (or maybe a container that is less refined) that is the Rifle scene, I would like to add the perspective of Andy Raether whose voice has been conspicuously missing through all this. I talked with him last night at the Spot and without going too much into the conversation which was not "for the record", suffice it to say that 1. Certain climbers had made it clear they would climb the route regardless of Andy's wishes and 2. He is sufficiently upset to write a column on the topic that will be published in the next Rock and Ice. My personal thoughts on the matter, having adopted a number of old/abandoned projects in Clear Creek and Boulder Canyon, is that if you can't get the equipper's permission you really should back off other people's work and find your own vision. It would be upsetting, I imagine, to see Dave Graham credited as "establishing" and naming a climb that you first saw, obtained permission for, and then went up and cleaned, stabilized, and bolted. I can understand "professional" climbers who seem content avoiding having a real job but I don't understand avoiding actually creating new climbs as well. Repeats don't matter much and jumping on other people's projects is not pushing the envelope. I wish that the likes of MVM and industry sponsors would recognize this. On a related note, I read with some dismay in Justin Roth's column in Climbing about pad-stashing, that boulderers carrying more than one pad were being confronted by suspicious pad-stashers. Although I am already on the record on this, I again applaud the rangers hauling abandoned pads away. If you can't carry your weight, don't get up in the face of people who can. On a more positive note, I will be volunteering tomorrow at the Horsetooth Hang and am looking forward to getting a better picture of the bouldering there as it is only a few minutes away from where I work. I can relate to Andy, also being injured and having a red-tagged project out there still. Not sure why Graham couldn't give him more time before "bottom feeding". Looking forward to seeing Andy's side of this in R&I. Many people (not me) feel red tags are a cheesy byproduct of the 80ies and nobody owns the rock, but there has to be some consession for the work and cost to establish a new line. Thanks Dan. What gets me is how the "pros" assume it's their right to climb the products of other people's labor. And then drum up publicity for it? BTW I can't get to your site now. Are you restricting access? Also sorry to hear about the injury. Hope things heal up soon. haven's seen Justin Roth's column, but I'll be looking for it shortly. c'mon, let's not take ourselves so seriously please. too bad if you're not strong enough to climb your project. there always will be someone else who can. deal with it. 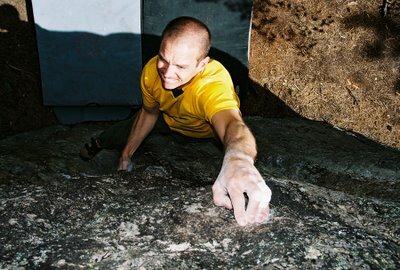 we all do"
Your comparison of bouldering and bolting a route at Rifle is misplaced and shows you haven't spent much time putting in new routes. Calling people like Andy names is out of line. When you have a record like his and even better an attitude like his, you can talk. i've put effort into establishing bouldering areas (never been to rife and at this point in my climbing, i don't think i'm sport climbing until i'm older and can't boulder). i'm the frist person to call my friends and tell them to do my projects. i want to see lines done. my resume might not include the same numbers as Andy's, but i've put 15 years in the game, trad climbing and bouldering. i have every right to call him out on immature antics. should i start with matt segal's holier than thou cause i place gear without kneepads persona? my attitude is on point of any other climber I know... send send send!!! i love when i send! i'm psyched for my friends to send, pyched to see when someone like Joe Kinder sends (met him a few times, by no means is even an acquaintance)! just recently, i caught some crap for showing little Paul one of the raddest boulders i've seen, 30 minutes from his house. of course he flashed the four established lines and did the the two amazing obvious projects (V11 each) quickly. i know my one buddies really wanted the projects, but too bad. projects go. 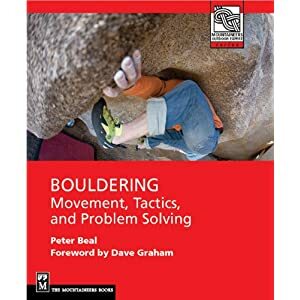 Fair enough regarding wanting people to send but my main point is that pro climbers need to learn about giving back and putting up new climbs, which are a lot harder to establish than boulder problems. That roof in NJ looks really good by the way. i understand. i just feel that especially in america, we have such limitations between access and the simple fact that we don't have world class sport crags all over like europe. if a place is already beyond exploited (rifle, maple canyon, the new, red, rumney, etc), why lock up projects? what would happen Paxti was at rifle and wanted to climb girl talk? i have a feeling he'd take a crack at it and probably flash it at that.